Alorasaz: frozen city of fur trappers, loggers and miners, deep in Lormyr's wintery southlands. A peaceful place on the surface, but beneath lurk tensions and fears as two competing families struggle to control Alorasaz's wealth. And what of Castle Kaneloon, standing on the very edge of the world? Does the Lady Myshella not exert an influence over sleepy Alorqasaz? Raschil: the bustling, civilised port city of Firkhar, a cosmopolitan place where many nations rub shoulders in the countless taverns and inns. But a city with its own secrets too: why, for instance, has the Queen not been seen for months when, once, whe was society's doyenne? Ryfel: built from black granite and mud-brick on Pilarayd's wild and treacherous northern coast: a city of pirates and reavers, and a meeting place for the barbaric clans of the interior. Ryfel attracts the proponents of Chaos and Disorder; sorcerers, murderers and dark cultists; thieves, fugitives and feuding clansmen. Pan Tang holds court here; but are the Pikaraydian chieftains as enthralled as Pan Tang believes them to be? Volume One of 'Cities of the Young Kingdoms' explores three, very different cities of the Young Kingdoms' southern continent. Each city is described in detail with maps, locations, personalities, game statistics and dozens of adventure hooks. 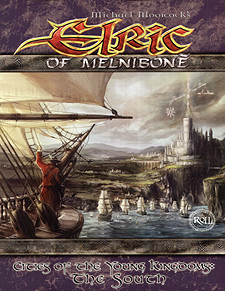 The cities can be used as standalone backdrops for Elric of Melnibone games, bases for adventurers, or as part of the mini-campaign that threads between them and joins them together.